Additional Info: Excellent quality throughout wall art and vases give a real home from home feel. Included for free Highchair and travel cot, bed side . Books and Nightlight in children's room. Children's games and many dvd's. LATE CHECK OUT AT 12 IS INCLUDED ON EVERY BREAK. All booking require an additional damage bond of £100 for family breaks which may be paid by cheque to be held and destroyed following the holiday. For Adult only breaks the bond is £125 and cheques are not accepted. 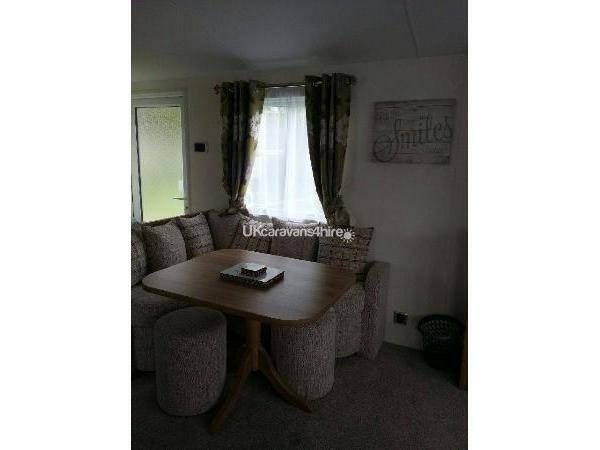 New in 2015 Willerby Rio Premier 3 Bedroom Caravan to rent on Butlins Minehead. We are plot 176 Lakeside Quay, in the centre of the caravan park and just 10 minute walk to the of the skyline pavilion. We are a safe distance from the lake, so the children can play outside on the large grass area without the constant worry of open water. There is also a central grassed area and a small grouping of trees which provides extra privacy - also great for a game of hide and seek. 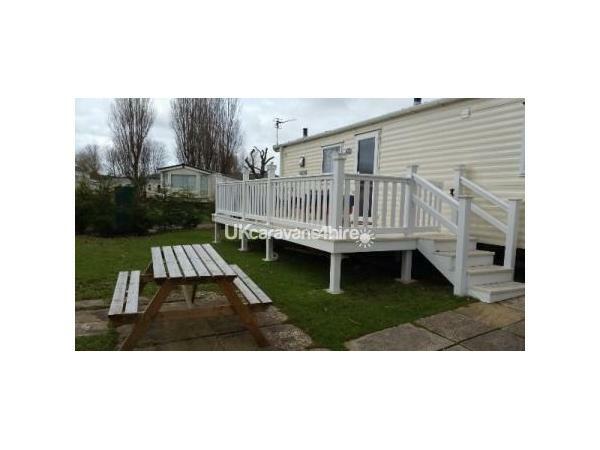 We have a large gated decked area with rattan furniture in addition to the patio area where you can have a BBQ and make use of the picnic bench. You get all the extras you would usually expect from a Butlins holiday but so much more! Our Caravan sleeps 6 in a spacious double bedroom with large wardrobe and vanity area, this bedroom also has an en-suite toilet with basin, handy for when some is having a shower. There are a a further 2 bedrooms, each with 2 single beds in. These beds can be pushed together to make a double if required. Each bedroom has wardrobes and bedside tables, central heating radiators are also in every room. An added feature of booking our holiday home is that you will have linen, with mattress protectors, sheets, pillow cases and duvet covers INCLUDED in every break. You beds will even be made up ready for your arrival! 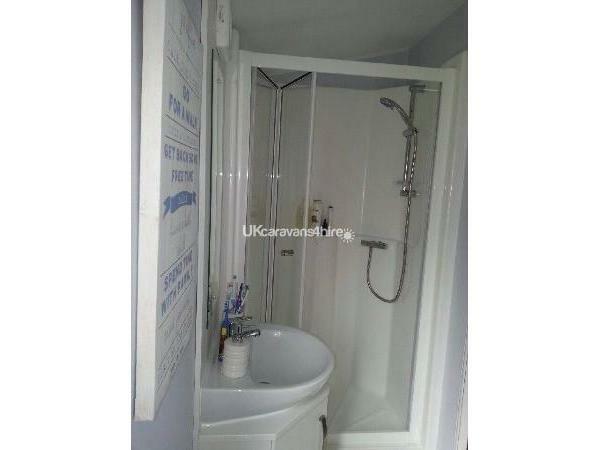 You will also find a shower room with spacious shower and a second toilet, hand wash is provided. Please bring your own towels. You will find a fully equipped kitchen allowing you to go completely self-catering with all the pots/pans plates cutlery that you could need. We also included childrens plates, cups bowls and cutlery. You have a full size cooker with extractor fan and even better, there is a full size fridge and freezer so you can do a proper shop. You will find a dining area to fit six, with place mats and coasters. 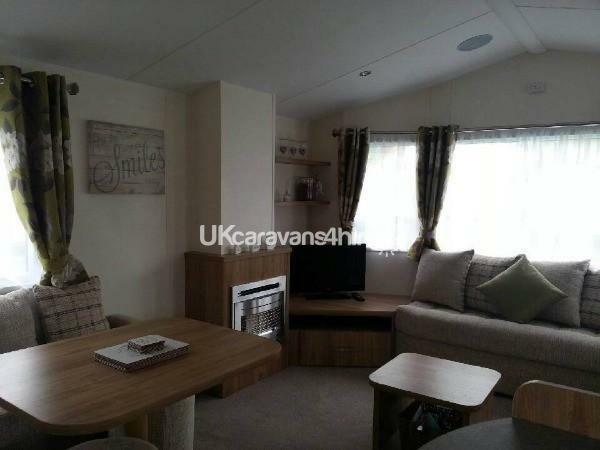 In the living room you have a large seating area with large home style settees, with plenty of room for everyone. You also have a flat screen TV with DVD player in the living room and an additional dvd player in the master bedroom we also have a selection of over 60 DVDs for your use. Under the TV you will find a PlayStation 2 with 2 controllers and a variety of games. We also have a built in MP3 system so bring your lead with you and you will be able to play music from your phone through the integrated sound system. We have monopoly, connect 4, battleships, dominoes, cards, snakes and ladders, drafts, chess, ludo, and buckaroo all available le for your use. We also have a selection of books for all ages and a nightlight in one of the smaller bedrooms. 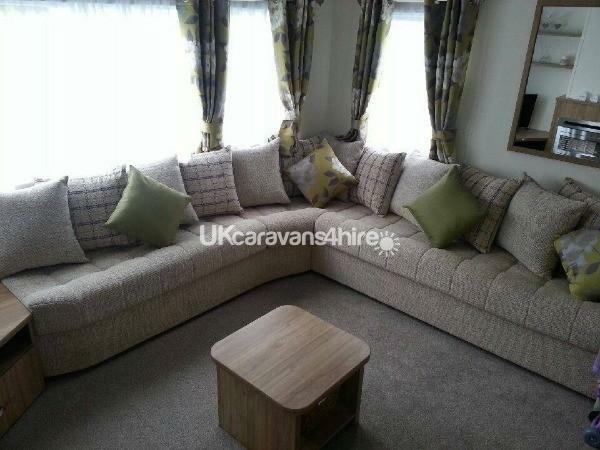 The whole caravan is central heated an double glazed so you are guaranteed to be warm whatever the weather outside. We have one of the largest plots on site and there is a spacious area next to the van for the kids to play. You also have the added bonus of a dedicated parking space just a few metres from the van most accommodation on Butlins does not include this. Because our pitch is 3 back from the road you also do not need to worry about being disturbed by traffic, and it is safer for children to play. We offer payment via cheque, bank transfer, or go cardless - which is a direct debit payment system. Money is taken securly by a vendor, and then passed onto us, meaning we have no access to your bank details. It is an alternative to paypal, but you are covered by the direct debit guarantee. As responsible owners we are committed to ensuring that anyone who rents with us has 100% peace of mind. We are aware that there has been a rise in caravan rental fraud over recent years, and urge you to protect yourself when booking caravans on the internet, especially through Facebook. For this reason we have chosen to offer easy pay as a method of payment at no extra cost to you. You can also set up a monthly direct debit to pay us a bit each month, making your holiday more affordable. You will pay a deposit of a minimum £50 when you return the booking form. The full balance with an additional damage bond of £100 will be due at least 8 weeks before your holiday. For last minute breaks full balance is payable. Caravan inventory - here is a list to help you decide what not to pack. 4 single Beds, 1 double. Full size cooker with 4 ring hob and grill and extractor fan. Torch - just in case! TV with dvd player on master bedroom (please note does not work as a standalone tv). Ornaments and Wall art in every room. Tea, coffee,sugar canisters - these will be refilled periodically. Board Games such as connect four, battleships, drafts, chess, buckaroo, monopoly. Travel cot provided for free but please bring your own sheets for this. Children's Plates, Cups, Bowls, Cutlery. 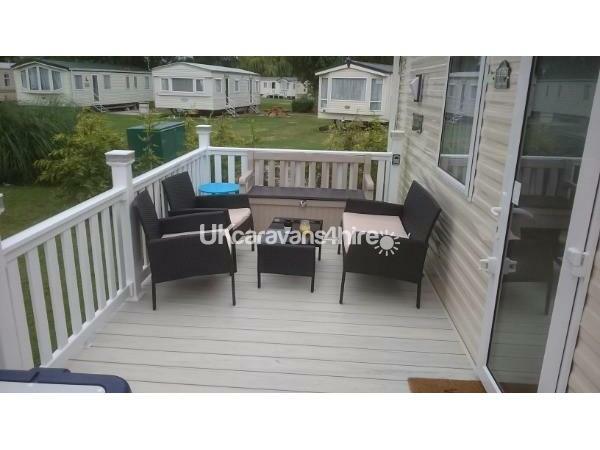 The caravan park is absolutely part of Butlins Minehead have a look at their website for a full list of entertainment the list is huge, and offers none stop action day and night with the majority of things included in the price of passes. What is included in the pass prices and what do I pay extra for? Our Splash Waterworld is the ultimate family water park and you will find a Splash Waterworld at each of our resorts. You'll step into an amazing world filled with tropical plants and unexpected delights, where you can paddle in perfectly heated pools, zoom down high-octane flumes, float gently along the lazy river or just relax and unwind on a comfy lounger. With a special shallow area for little ones with mini slides and fountains as well as fast flumes and raft rides for the older ones, there is surely something for everyone to look forwards to at Splash Waterworld Rain never stops play at Butlins so jump on in! Do I have to pay? No, this is included in the price of your break. When's it on? It's on every break at all three of our resorts. Do I need to book? There's no need to book ahead for this activity. The Traditional Fairground is open all year round (weather permitting) and offers the perfect place to add a little bit of extra sparkle to your family break. Your little ones will smile from ear to ear as they get to ride on all the wonderful attractions whilst bigger kids can let loose on the Go Kart track. To keep you safe, some of these rides are subject to restrictions regarding age, medical conditions, height and weight. Do I have to pay? No, this is included in the price of your break. * *Go Carts £5 and Bumper Boats - Each ride costs just £5 per person for 6 mins and £8 per person for 12 mins. Children must be able to wear a life jacket. The Tots Fairground is an exciting experience your under 5s will love. Created with little ones in mind these rides are smaller and gentle making them perfect for your under 5 to try something new. - No extra charge, ride as many times as you like. Come rain or shine there is always plenty of places to play at Butlins. You'll'll find an indoor soft play area as well as plenty of outdoor playgrounds. Perfect for burning off some energy - all play areas including indoor are free. Play with the whole family and see who is the best putter and who can get the highest score. Do I have to pay? There is a little extra cost for this activity of £2.50 per person. Serve up some fun with Beach Volleyball or smash a six with Beach Cricket on the beach. Beach Sports are great fun and something the whole family can join in with. Fun fencing sessions are designed for 5- 7 year olds. Fully trained coaches will help your little one to learn the art of Fencing. Don?t worry, they use foam foils, so it?s completely safe!, there is no extra charge. Rain never stops play at Butlins, so why not challenge your family to a game of Bowling? This activity is not included in the price of your break, a small extra charge of £6 per adult and £5 per child applies. Designed just for them, these under 5 arts and crafts sessions will give your little ones the opportunity to get messy whilst having fun creating and learning new skills. Join in one of the Get Busy sessions which have been designed especially for 5 to 8 year olds. It's the perfect opportunity to get creative or learn new skills, whilst meeting new friends. Club Red sessions are ideal for children aged between 9 and 12 years old. Hosted by Redcoats these sessions focus on helping you youngsters to create new friendship and gain some independence whilst getting creative with fun activities such as graffiti art. Meet all of your favourite TV characters in one place. Catch Mike the Knight, Angelina Ballerina, Bob the Builder, Thomas and Friends and Scooby-doo in their individual shows, ideal for little ones with short attention spans. Get ready to be amazed, this year Butlins have some fantastic evening shows lined up for you. Aladdin Rocks, The Con-mitments and Shaolin Monks. So take your seats in Centre Stage and enjoy an evening of entertainment. How do I check In/Out? Exactly the same way you would if you had booked direct. You will check in at the usual Butlins check in point, here you will recieve your keys and passes. You can also use the key box on your way out. The beach is a short walk away just opposite the main entrance to the park. It is a really nice beach, which does not get too busy in the summer, there is also ample parking by the beach if you want to take your car.